Hi there, I’m Shreya! I’m fueled by effortless experiences and dedicated to building products that strengthen our relationship with technology and propel our society forward. The current wearable technology space exists in two extremes: from the generalized & low-cost device for the casual walker to highly sensitive & expensive devices for professional athletes. However, the resources available for the casual athletes and enthusiasts to accurately track health and fitness parameters falls short. Project X is an exploration into deepening the wearable technology space, with an aim of pushing the boundaries of our knowledge of the limits of the human body. In the field of health technology there are many devices that are available that track a variety of health parameters. However, it is important to note that these parameters are influenced by a number of factors that are unique to each individual. An issue within health technology that needs to be addressed is discovering a method to accurately reflect each individual’s metrics without generalizing to the wider population. I also researched the current drawbacks of health technology space to better understand where the gaps exist and to solve the problems that aligned with them. The following are a few quotes that encompass the gaps of the wearable space. By developing this spectrum, I divided the general population into three main categories and realized that my target base fell somewhere on the further right of the spectrum. Using this information, I crafted a list of pain points that needed to be addressed during the creation phase. The people who will adopt wearables are the people who are more serious about their health metrics, or the regular athlete. Following this realization, I created two user personas to serve as the anchor point for understanding the user base. How might we create a device that seamlessly translates each person's unique body metrics into valuable, simple, and informative content that helps them achieve their goals? New technology is a hard market to break into for a variety of reasons. Production costs are quite high for this type of wearable to not only be accurate, but also durable through washing cycles. Additionally, the device would have to be non-invasive, non-intrusive, and seamless. These constraints led me to think of the most viable solution: mini-sensors in clothing. Clothing was the most viable option because it solved multiple constraint problems. Clothes proved to be the lowest barrier to entry because they don't add an extra device and are non-intrusive because the sensors are embedded into the fabric. 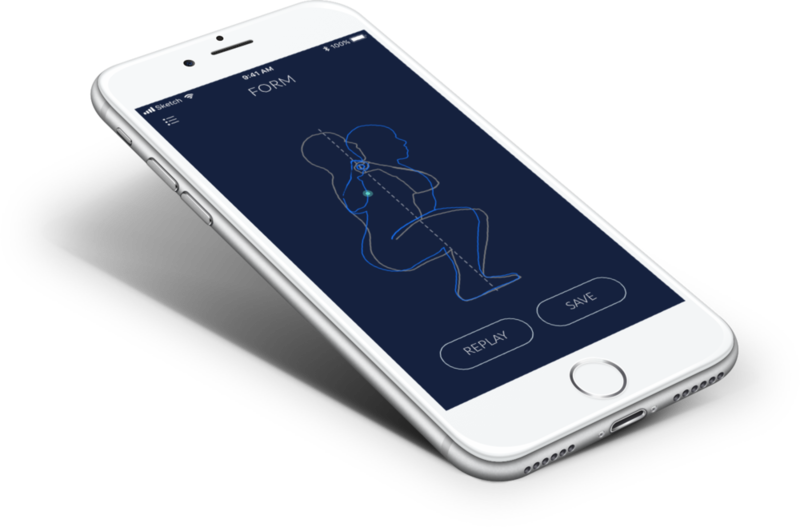 The ECG and respiratory sensors would link via bluetooth to a mobile application that would translate raw analytical data into information that the user could easily absorb. These metrics were based on information collected from potential users, desk research, and conversations I had throughout the process. After determining these key metrics, I created an experience map to identify the key areas in each metric and to define the goals and what success would look like when each of these metrics were displayed. Creating this experience map allowed me to visualize at ground level how people would interact with the interface and helped describe the emotions each screen and each action should elicit. Through this experience map, I gained a few valuable discoveries such as the importance of staying away from arbitrary values. The ideation phase consisted of two important parts: coming up with potential types of wearables keeping pain points and constraints in mind, as well as developing a well-designed interface that presented raw data into simple content. Both of these ideation phases are outlined below. 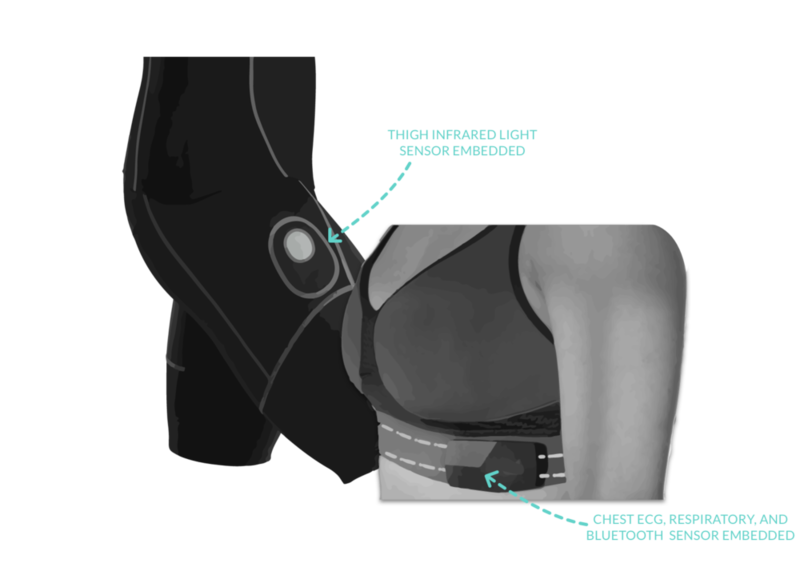 From my research, the ideation phase made it clear to me that the best clothing to use sensors in were compression shirts and leggings/skin-tight shorts (for men) or a sports bra and leggings/skin-tight shorts combination (for women). These not only provide the most contact with the skin for the fabric to work, but also are inherent to most users workout routine and have the least amount of friction for adoption. Below are the final design decisions I made to implement within this product. I chose to keep the wearable design simple, drawing from inspirations of other devices on the market such as OMSignal, Ralph Lauren's compression shirt, and regular compression tights and shorts. The sensors are small enough to be embedded into these garments without any hassle. The biggest challenge I faced when designing the application interface was determining how to most simply present all the available data. 1. The effort screen also aims to reduce clutter and provide the most important percentages necessary for a user to gauge their training exertion. I placed a lot of emphasis on making sure users could read information off the screen quickly and absorb the critical information in a short amount of time (ie. in between sets, while running, during rest periods). 3. This screen was created to specifically address user concerns of being able to track form development. The form reading uses sensors to determine whether there are certain muscles getting pulled or strained, and whether this strain is harmful for the body. This screen is intentionally vacant, as the visual provides all the information the user needs including the points at which the strain occurs. The user can also choose to replay the repetition or save the animation for future reference. 4. The body statistics was created specifically for users to measure their personal improvement over time. Using the respiration sensor, ECG, and oxygen consumption, the wearable tracks a user's time in each fitness level; important for people in endurance training or trying to train within a specific level. The landing page strips away all the complexities of any health app and only shows the user the four base categories as well as the time elapsed. The only feature I decided to add was "readiness", based on calculations of the user's state of rest before, during, and after each training session over the past 7 days. The chest sensor uses heart rate variability as well as proprietary breathing algorithms to calculate a person's fatigue gauge to determine what stage of recovery the user is at. 2. The stamina screen addressed the pain points of users being unable to accurately track their improvement over time. Using oxygen consumption from the respiration sensor as well as the infrared light sensor, the device combines the hemoglobin saturation readings and the user's oxygen intake to determine a "stamina score" which is easily translated into a percentage. I realized people aren’t going to care about the intricacies of oxygen consumption, they just want that translated into an intuitive reading. The user can easily compare weekly stamina scores to determine body efforts over time. The lungs correspond to the rate of the user's breathing, expanding when the user breathes in and contracting when the user breathes out. The circular levels gives the user a visual understanding of the lung capacity he/she is currently at and how much further is left to go. This provides the user with an understanding of breathing patterns and metrics without having to read a single word. Listen to your users. The goal of the product that I ended up creating was drastically different than the goal that I started with, and this transition happened only because I had multiple conversations with users. Don't design in isolation. I pushed myself to think about each part of the product and how it would interact with a user's ecosystem as a whole, as well as the implications designs would have on the user. New technology has a lot of friction. It was even more important to do as much research as possible to make sure this device would be solving a particular problem, especially considering the novelty of the technology and the existing barriers to entry.